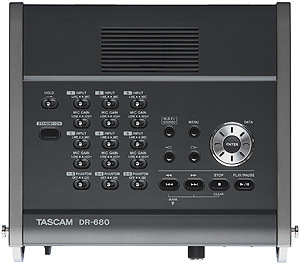 IF YOU ALREADY OWN AN TASCAM DR-680 YOU MAY STILL PURCHASE SOME OF ITS ACCESSORIES FROM OUR DR-680 WEBSHOP BELOW. TASCAM's DR-680 brings multi-channel portable recording within reach of any musician for polished live, location and surround recordings. Up to eight tracks can be recorded to solid-state SD card media at 96kHz/24-bit Broadcast WAV quality. Six mic inputs provide phantom power and 60dB of gain for great-sounding recordings with your condenser microphones. Record the six microphones along with a digital S/PDIF source for 8 track recording. Each mic input has a selectable low cut filter and analog limiter for optimal sound. Inputs can be monitored using a built-in mixer with level and pan controls for each input. The stereo mixdown can even be recorded along with the six mics for quick stereo playback of the event. There's even a built-in speaker to check recordings without headphones. In addition to WAV recording up to 96kHz, the DR-680 captures stereo audio at 192kHz/24-bit for audiophile-quality masters. 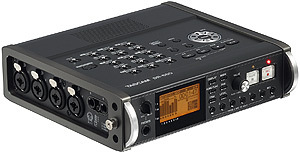 The DR-680 records up to four channels of MP3 audio for web-ready recordings. Two of the recorders can be connected with a cascade cable for up to 14-track recording on battery power. 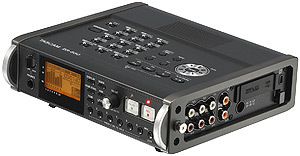 Multi-channel portable recording has never been as simple or affordable as the TASCAM DR-680.